1) Upload a new file to my person documents in my SharePoint site. 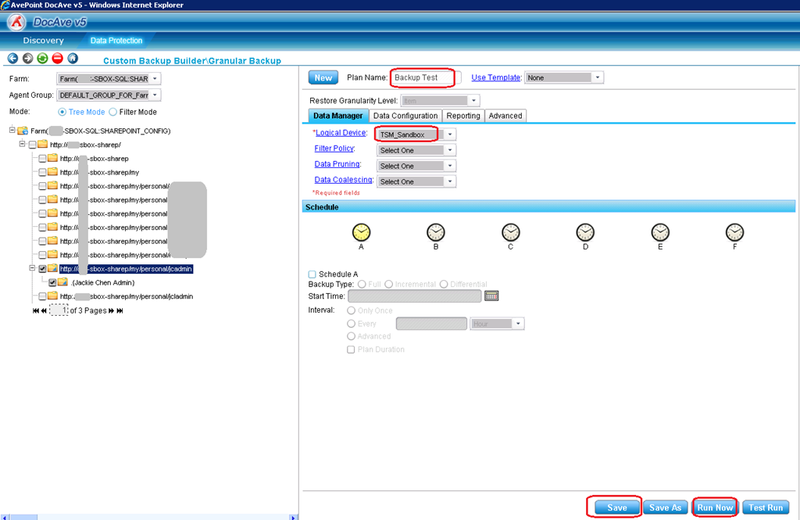 2) Login into the DocAve manager. Go to Data Protection and choose the SharePoint farm and default agent group. Give it a plan name and choose ‘TSM_Sandbox’ as the logical device. Click save then choose ‘Run Now’. 3) Choose ‘Full’ then click ‘Run’. 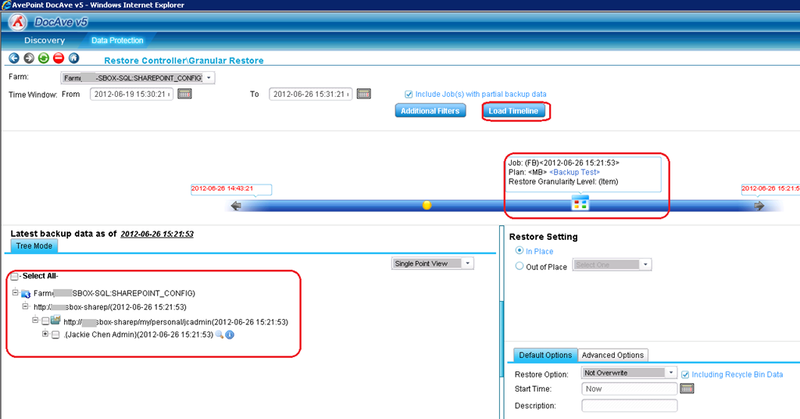 4) Go to the ‘Job Monitor’, you can see the completion status of this job. 5) Remove the document that I uploaded in step 1), and also remove it from the recycle bin. 6) Now I am going to restore the file from the backup. Click ‘Restore Controller’ > ‘Granular Restore’. 7) Choose Farm and the time range then click ‘Load Timeline’. Click the time point of the ‘Backup Test’. Then expand the tree. 8) Expand the tree and choose the document that needs to be restored. Click ‘OK’ then click ‘Go’. 9) Check the Restore status in the ‘Job Report’. 10) Go back my personal document, and the file is back now. Next Post TSM 6.3: (Type) Site Collection (Path) Error message: An error occurred while backup a list. Id:00000000-0000-0000-0000-000000000000, Url:00000000-0000-0000-0000-000000000000.Object reference not set to an instance of an object.